This style is very much based on methods outlined by Reginald Farrer in his two-volume book The English Rock Garden, published in 1919, as well as earlier works by Farrer and other garden writers. These writers all laid out very detailed instructions on the “proper construction and planting” of rock gardens. Farrer drew heavily on the idea of creating naturalistic-looking gardens that make use of rugged stones, arranged with their strata aligned to mimic what might happen in nature in a rock outcropping. Think of the rocks as icebergs, with only a small portion (about one third) of their surface area actually exposed above the ground. The cracks and crevices in between the rocks are packed with a gritty soil mixture during construction, even introducing actual plants in these tight spaces as the rocks are arranged. The garden is carefully built up layer by layer, with a great deal of consideration given to placing each and every rock. Needless to say, this method is not exactly fast or easy. Reginald Farrer’s revolutionary approach was based partly a reaction to really lavish examples of whimsical rock gardens built in Victorian times that included grottos (picturesque caves), follies (costly ornamental buildings serving no practical purpose) and other structures that looked contrived. In these gardens often very little consideration was given to actually growing alpine plants. Another common extreme of the day was shaping a large pile of soil and studding it with boulders, a style that Farrer himself described as looking like an “almond pudding” or “dog’s grave”. Guess he didn’t like it much! Another reason for Farrer’s construction techniques was to provide a much more suitable environment to grow alpine plants than older methods offered. His rock arrangements provided cool, deep crevices where alpines could put down their roots in quest of moisture and cool temperatures, with their tops and crowns high and dry – critical to success in the notoriously damp British climate. This drawing shows one way of creating a natural-looking rock outcrop. In nature, such formations are usually mostly buried, and the exposed rock surfaces and strata or erosion lines are usually at the same or similar angles. There are many recipes for soil mixes for a traditional English style rock garden. We prefer the approach of one basic soil mix for all styles. Build in layers, filling in between the rocks with this soil blend as you go. It’s important to pack the mix in well between the stones using, for instance, the end of a piece of 4” × 4” (or 2” × 2” in narrow crevices) or any other cramming tool you might think up. Watering the area before moving on to next layer is wise, so the soil has a chance to settle and fill in any hidden air spaces. 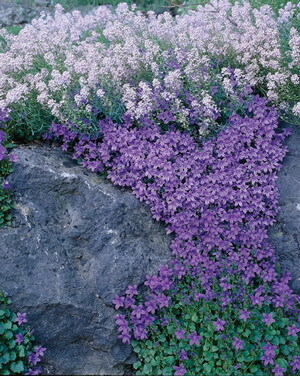 Our various Plant Searches are a good place to start when it comes to choosing the right Rock Stars® for your garden. You’ll quickly find some types that are appropriate to your region and appeal to your tastes. Also look through the perennial department at your local nurseries and garden centers. They may well stock other kinds of perennials appropriate to rock gardens that we don’t yet even know about. You might also want to include dwarf conifers to provide some more substantial shapes and some interest in the winter months. We have a whole other line of low-growing plants called Jeepers Creepers™ that are also excellent candidates for a traditional style of rock garden. You can place plants in tight cracks and crevices during construction, though this can also be done afterwards and is perhaps going to result in fewer squashed and stepped-on Rock Stars®. We suggest watering the garden when construction is complete, and waiting for a few days before doing your main planting in order to let the soil settle. This way you can fix any sink-holes that might appear during settling. 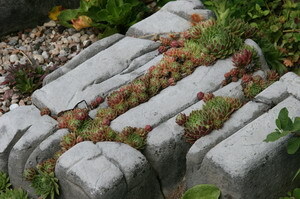 Steep crevices between some of your stones are pretty much inevitable: see our page on Wall Gardens for some helpful ideas on planting these. Now you can arrange your plants by setting out the pots and moving them around. We suggest starting in one small section of your rock garden first, then moving to an adjacent area and so on until the whole area is covered. Bear in mind our plant spread ranges while doing this, since mature width varies quite a bit from one variety to the next. Think of varying the shapes of your plants, and consider flower colour, blooming time and foliage colour and texture. Once you are satisfied with your plant arrangement, go ahead and plant your Rock Stars®. 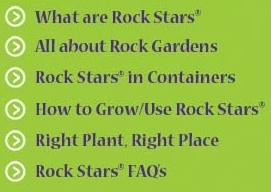 Our How to Use and Grow Rock Stars® page gives detailed instructions on planting and also about laying down a gravel mulch after planting.